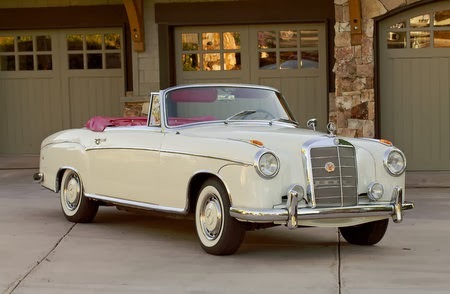 Ein 1958 Mercedes-Benz 220 S Cabriolet erzielte bei der RM Auction in Hershey, welche am 10. und 11. Oktober 2013 stattfand, einen Verkaufserlös von 77.000 Dollar. 105 bhp, 2,195 cc OHC inline six-cylinder engine with dual carburetors, four-speed manual transmission, independent front suspension with coil springs, swing-axle rear suspension with coil springs, and four-wheel servo-assisted hydraulic drum brakes. Wheelbase: 106.3 in. 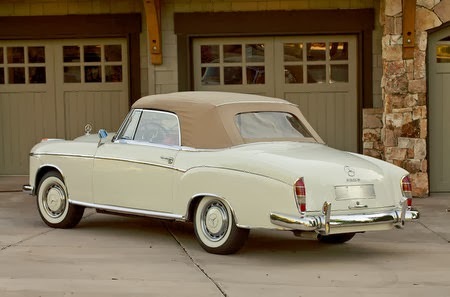 First introduced in 1956, the Mercedes-Benz 220 S was perched atop the 220 model range and was the last of the “Ponton” series Mercedes-Benzes. Featuring a unitized body/frame construction and a fully independent suspension, the 220 S provided the kind of motoring experience that Mercedes-Benz’s demanding clients had come to expect of one of the most storied brands in automotive history, especially from the flagship “S-Class” models. The most desirable version of the 220 S was the cabriolet model. Built to exacting cosmetic and mechanical standards, a cabriolet cost 75% more than a comparable 220 S sedan, and it was easy to see why. Almost everything the occupants could touch in the interior was either leather or wood, which provided for one of the most elegant driving experiences of the time. The cabriolet could ferry its driver and three passengers down the motorway and allow them to soak up the sun in fantastic style. 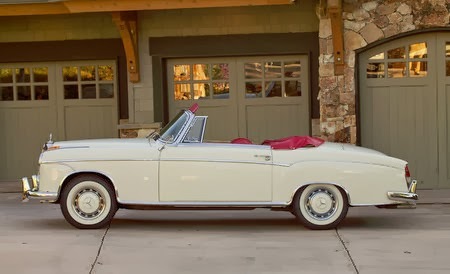 Before coming into the hands of its current owner, this 1958 Mercedes 220 S Cabriolet was acquired by a couple in California in 1986, sporting an engine block from an earlier 219 model Mercedes-Benz. Just one year after the car was purchased, the engine was professionally rebuilt with twin carburetors and a supporting manifold by Walnut Creek Mercedes Repair in Walnut Creek, California. After being repainted white, the couple enjoyed the car for nine years, until the husband passed away in 1995. At that time, the widow stored the car in her garage and used it sparingly until parting with the car earlier this year. The current owner then commissioned an expert Mercedes-Benz mechanic to bring the car back to functioning condition, and he refurbished or replaced many mechanical parts, including the fuel pump, fuel filter, oil filter, windshield wipers, and the brake lines and master cylinder. 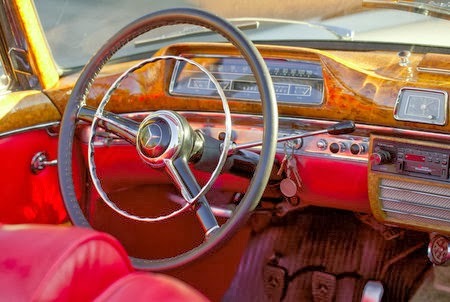 Several non-essential items on the car, including the heater and vents, radio, clock, and original temperature gauge, are currently not functioning, but they could be restored to working order if a new owner so desired. The paint looks very good, and the red leather interior and tan convertible top both show very few signs of wear. Detailed service receipts from 1986 onwards are included with the car, and they indicate that the car has been driven approximately 3,000 miles since the engine rebuild. While the car still needs minor refurbishing to bring its non-essential mechanical details into working order, this example would be a fine driver for anyone looking to go out and enjoy the pleasures of top-down motoring in a classic Mercedes-Benz, whether it be going to car shows or taking part in long-distance rallies. Mercedes-Benz 220 S Cabriolets attract nearly as much attention on the road today as they did when they were new, and this example will certainly be no exception.